The ViewScan II, redesigned by Diemasters. Diemasters Manufacturing, Inc., Elk Grove Village, IL, received the 2013 Higgins-Caditz Design Award for its redesign of the ViewScan microfilm/microfiche reader that it manufactures for ST Imaging. The reader finds use throughout the library/education and civil defense industries. 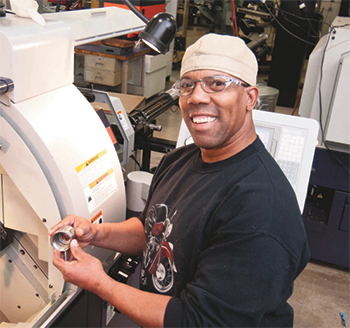 Diemasters employs more than 100 workers who create as many as 250,000 stamped parts, assemblies and fabrications daily for the lawn and garden, automotive, medical and aerospace industries. 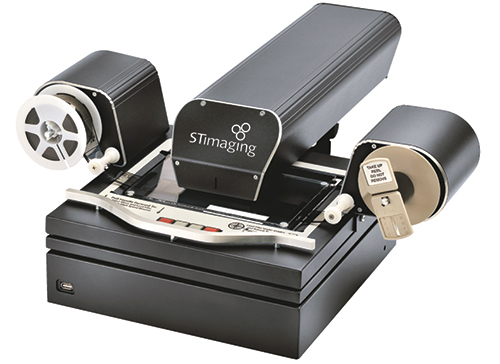 When ST Imaging began manufacturing the ST ViewScan in 2005, Diemasters produced only its fabricated metal exterior casing. In 2009, when ST Imaging started encountering quality and late delivery issues with its overseas supplier, it asked Diemasters to examine whether it could take on greater responsibility. By applying The Diemasters Productivity System (TDPS) principals to the project, it started to identify major constraints hindering the process. Eliminating the most detrimental constraints in the process allowed Diemasters to stabilize the process and provide ST Imaging with a reliable, high-quality productivity system that would ensure on-time shipments of high-quality products. • Can accommodate and scan 16- and 35-mm microfilm and all variations of microfiche—the original model could only scan 35-mm film. • Increased sales forecast by 25 percent. Created by the Worcester Pressed Steel Co., Worcester, MA, and sponsored by The Quarterly Club, The Design Award recognizes a manufacturing company for outstanding achievement in developing an innovative product design. The Diemasters received a $1500 cash prize. Ramcel Engineering Company, Northbrook, IL, received the 2013 Link Systems Process Control Award for its advancements in automated inspection. The company employs more than 50 associates and a variety of processes to serve customers in the automotive, electronics and other industries. Ramcel recently developed a PLC-controlled two-up lamination die used to produce two separate part numbers—an 81-piece stack and a 90-piece stack—used in an automotive electronic power-steering application. The customer requires 100-percent inspection of critical dimensions—ID and overall height. The PLC allows Ramcel to control stack height with an in-run adjustment. The die also contains two barrels at the blank-out station. To turn the barrels, servo motors connect to the PLC; each barrel rotates 60 deg. after every stroke to negate high or low spots in the strip. Ramcel’s two-up lamination die runs at 270 strokes/min. The two-up operation also presented traceability issues. 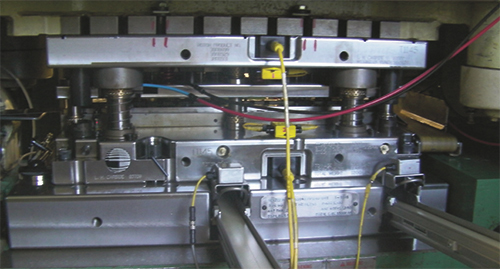 Ramcel distinguishes which side of the die on which each part is completed with a PLC-controlled event that triggers a marking punch on the last lamination of each stack. Proximity sensors detect the height of the part inside of a precision-milled fixture; the sensors relay a pass/fail signal to the PLC. A Motoman robotic arm programmed with point-to-point logic and equipped with a double-headed air-powered gripper picks up parts from the station and places them into an ID check station. An eddy-current probe attached to a Robo-Cylinder arm scans the part over two channels. The probe checks part ID to a tolerance of ±0.06 mm. If the part fails, it is placed inside of a locked bin for further inspection. Parts that pass route to one of two rotating packing stations, keeping right- and left-barrel parts separate. At the packing station, Ramcel maintains a monitor that keeps real-time X-Bar and R Charts for immediate interpretation of current run status. In time studies of an operator performing manual checks and entering data into a spreadsheet, cycle time per part averaged 67 sec. With automation, cycle time is a mere 9 sec. Sponsored by Link Systems, Nashville, TN, the Process Control Award promotes the application of electronic-analog closed-loop process controls in the metalforming process by recognizing innovative electronic solutions implemented by a North American manufacturing company, which have resulted in significant quality, cost reduction and/or productivity improvements. Ramcel Engineering Company received a $1500 cash prize. American Roll Formed Products (ARFP), Painesville, OH, received the 2013 Pitcher Insurance Agency Safety Award for its outstanding safety and health program. Employing 120 people at three locations in Ohio and Nevada, the company provides rollforming as well as CNC punching, brake-press forming and robotic-welding services. Safety is the first of ARFP’s 13 principles for doing business; it holds every employee accountable. Along with this culture, the firm has invested countless hours and more than $1 million during the last 5 yr. to improve its safety performance. In addition, ARFP continues to develop its safety committee. All committee members are trained first responders; participate in incident reviews and corrective-action development and implementation; and review weekly facility inspections to identify trends or areas for improvement. As a result of these improvements, the company experienced a 66-percent drop in recordable injuries, including a significant reduction in injury severity. ARFP also has begun a return-to-work effort that has netted a 40-percent reduction in days a from work. The company also was recently recognized by the Lake County Safety Council, receiving its Achievement Award for a 25-percent or more reduction in lost workdays. The Safety Award, sponsored by Pitcher Insurance Agency, Chicago, IL, acknowledges either an effective comprehensive safety program or a specific innovative idea in the context of an effective safety program. ARFP received a $1500 cash prize. Pridgeon & Clay, Inc., Grand Rapids, MI, received the 2013 A.R. Hedberg Training and Education Award for its Career Paths program. The program is designed to provide a clear progression of formal education and experience-based skill acquisition, to move employees in highly skilled classifications from entry level to the equivalent of a journeyperson. It also ensures the timely development of employees’ career paths/goals in a specific field. The Pridgeon & Clay program has a start and end point for each individual, and also is designed to be an institutionalized, ongoing development program similar to a traditional apprenticeship program. As employees graduate, they gain greater responsibilities as the trainers and mentors of those following them in the program. This allows employees to continuously update the skills they are required to teach. The Career Paths program is a joint effort between training and development, human resources and each department that contains highly skilled classifications within the program. Each department includes subject-matter experts and decision makers available to draft, gain buy-in for and implement each Career Path. Employees enter the program through the external hiring process or the internal promotion process. Each path requires candidates to complete two valid and reliable assessments and a self-assessment based on the training checklist for that classification. Candidates also complete a multiple-interview process. Team leaders and higher-level techs conduct on-the-job training that is tracked to monitor progress. Each employee within the program must complete at least one class per semester in an approved Associate’s Degree curriculum, under the company’s tuition reimbursement benefit, and reach Tier 2 of their classification within 7 yr.
Current classifications in the Career Paths program include Metal Model Maker, Quality Layout Technician, Laser Technician/Programmer, CNC–R&D, Low Volume Technician, and Die Technician–Maintenance/Repair. Pridgeon & Clay plans to create at least three more Career Paths by the end of 2013. In addition to employees benefiting by achieving their career goals, Pridgeon & Clay benefits by growing talent from within the organization at a time when there is a lack of highly skilled workers available for employment. Since each employee demonstrates steady, focused progression in his skill development, Pridgeon & Clay retains a consistent depth of talent in all classifications within the program. The program has helped Pridgeon & Clay change its culture from relying on certain “go-to” employees to turning everyone in the department into a “go-to” person. The Training and Education Award recognizes outstanding achievement by a PMA member company in employee technical education through a comprehensive training program. The award is sponsored by HPL Stampings, Inc., Lake Zurich, IL, in memory of A.R. (Ray) Hedberg, a leader in employee training. Pridgeon & Clay received a $1500 cash prize, to present to an educational institution that provides coursework directly enhancing metalforming technology. Pentaflex, Inc., Springfield, OH, received the 2013 Waukesha Metal Products Excellence in Quality Award for its quality-system improvements that have resulted in reduced PPM ratings. PPM went from 294 in 2011 to 67 in 2012 to 3 PPM through the first five months of 2013. Pentaflex is a contract stamper specializing in deep-draw heavy-gauge stampings and welded assemblies for the heavy truck market. It also services the automotive, agricultural, off-high and defense industries. Pentaflex’s attacked its PPM issues using formal problem solving and the use of the 8D process; availability of better data through its Plex ERP system; ongoing continuous-improvement efforts; and formal training through Six Sigma and lean. At the shop-floor level, the firm receives CARs from its customer base and posts them as quality alerts. It processes 8Ds with shop-floor input to provide corrective actions. In the case of Tier 2 supplier quality issues, it prepares internal CARs and sends them to the Tier 2 supplier for corrective action. Using the Plex ERP system, quality instructions are catalogued for operator use. To enhance Pentaflex’s problem-solving techniques and directly attack lean-manufacturing opportunities, in 2013 the firm launched Six Sigma black- and green-belt training programs. One black belt and two green belts completed training; management expects all employees to receive formal lean-manufacturing training. To date, its lean-action teams have completed six projects, focusing primarily on 5S. The introduction of Plex as a management tool has enhanced Pentaflex’s ability to generate correct and appropriate data in support of problem-solving efforts and definition of machine/tool/operator accountability. Plex also has allowed Pentaflex to better understand efficiency and utilization of company efforts by product and by employees. The Quality Award, sponsored by Waukesha Metal Products, Sussex, WI, recognizes outstanding achievement by a manufacturing company in the development and implementation of a company-wide quality system that effectively uses continuous improvement. Pentaflex received a $1500 cash prize. 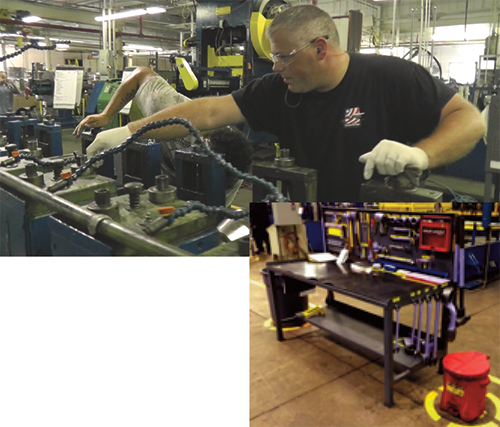 Pentaflex, Inc., Springfield, OH, also received the 2013 Zierick Manufacturing Corporation Productivity Award, for its production of stamped outer inlet chambers for a Class 8 truck exhaust-system converter package. Parts are stamped using a cell configuration comprising a blanking press, hydraulic press with a mechanical transfer system, and an inline washer system. To facilitate a customer design change that increased blank thickness from 1.5 mm to 2.5 mm and weight from 21 to 35 lb., along with the related ergonomic issues, Pentaflex employs a new 880-ton blanking press to bring the blanking operation inhouse. This eliminated outside logistics and transportation costs, and created one-pallet flow from blanking press to stamping press. To draw and form the parts, the firm employs a 1600-ton hydraulic transfer press, automated with conveyors to auto-feed from the press load station through four transfer stations, and then through a parts washer. The result: Pentaflex can run the cell with only two operators, compared to eight operators required to run the previously designed part on a hand-transfer press with an offline parts washer. Productivity has been dramatically improved, as press cycle time has been reduced from 60 sec. to 30 sec. Reduced press cycle time resulted in an additional 20-percent gain in hydraulic-press capacity. This allowed Pentaflex to achieve a 1-yr. payback on its facilities improvements. And, its customer received a five-percent value-added cost reduction. Last but not least, the new cellular process and tooling concept allowed Pentaflex to qualify for its first Research and Development tax credit—$20,000 for the 2012 tax year. The Productivity Award, sponsored by Zierick Manufacturing Corp., Mount Kisco, NY, recognizes outstanding achievement by a manufacturing company in the development and implementation of programs and processes, and use of assets that lead to significant improvements in productivity. Pentaflex received a $1500 cash prize. Two programs shared the 2013 Clips & Clamps Industries Educational Institution Award: Hennepin Technical College (HTC), Minneapolis, MN, and Southwestern Illinois College (SWIC), Granite City, IL. HTC received recognition for its M-Powered program, designed to help unemployed and underemployed individuals, those looking to start a new career and incumbents needing to upgrade their skills in the precision manufacturing industries. The program combines technical training with essential skills such as resume writing, interview techniques and leadership skills. M-Powered also includes wrap-around services, which help students identify and reduce educational and employment barriers. Each student works with an employment counselor who provides guidance outside of the classroom, while HTC provides advisors for inside the classroom. Students completing the levels earn college credits toward a 2-yr. machining program degree, industry credentials and an occupational certificate. In the Fast Track soldering program, individuals receive 120 hr. of training that prepares them to take the IPC J-STD-001 industry certification. They also can earn two college credits, 6.4 CEUs and IPC certification. Once completing the requirements, graduates begin a lifelong education and career in manufacturing. The M-Powered program has been a big success. In less than one year, the program allows students to earn $12-14 per hour with little or no manufacturing experience. HTC actively works with local manufacturing companies who participate on a business advisory committee that meets monthly. Eighty percent of companies involved with the PMA Twin Cities District have participated in the M-Powered program and have hired many HTC graduates. SWIC received its Educational Institution Award for its Precision Machining Technology (PMT) program. Students can earn a 2-yr. Associate in Applied Science degree and a 1-yr. Certificate of Technology in Precision Machining. SWIC has continued to invest significant resources into its PMT program, and made major advancements since 2011. 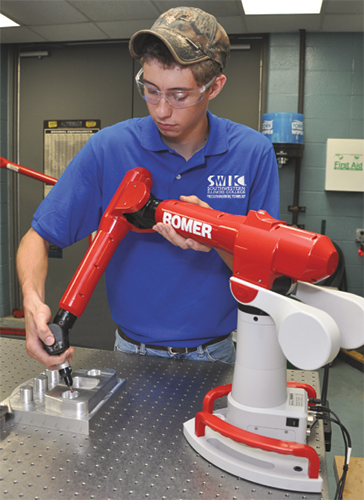 A federal Department of Labor (DoL) grant enabled the college to invest nearly $1 million to double the size of its PMT facilities, purchase new equipment and upgrade its machining curriculum. As a result, SWIC has revamped the associate degree and certificate of technology programs to develop higher-level skills for its students. Associate and certificate programs now include a large CNC component beginning in the first semester. Additional certificates are available in CNC Machining, Mastercam, Solidworks and Advanced CNC Programming. The DoL grant also allowed the college to develop advanced CNC courses in a sharable, online format for access by other educational institutions. SWIC effectively markets its PMT program by regularly visiting with high schools in the district. In addition, in 2013 the school created a new webpage and marketing video for its Technical Education Division. Part of SWIC’s marketing efforts includes the promotion of dual enrollments—students earn high-school and college credits for certain general education and technical courses. To date, 107 students from 11 high schools have enrolled in PMT dual-credit courses, many of whom will continue to pursue an AAS in the PMT program after high-school graduation. SWIC also works closely with industry representatives on an advisory committee that meets twice during each academic year. 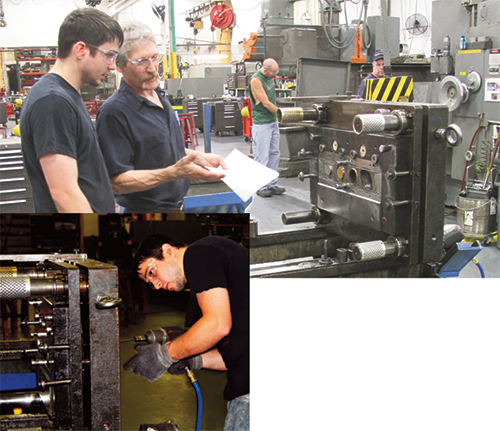 The committee helped to transform the college’s outdated industrial-machining program into the modern PMT program. Committee members also helped the college earn donations of new and used equipment and other supplies. Stake your claim to fame by submitting an entry for PMA’s 2014 Awards of Excellence in Metalforming. It’s your chance to recognize employees, have your company recognized within your industry, and let your customers—and potential customers—know what you bring to the table. Visit www.pma.org/awards to see details about each award, or contact Christie Carmigiano at 216/901-8800 or ccarmigiano@ pma.org for more information. The school’s efforts have paid dividends in multiple s. Students received recognition at the 2013 SkillsUSA competition, taking first place in Precision Machining, CNC Milling and CNC Turning in the state of Illinois. Total enrollment in the PMT program has increased from 86 students in the 2010-2011 school year to 146 students in the 2012-2013 year. Following graduation, nearly 90 percent of graduates have secured employment in the industry within six months.